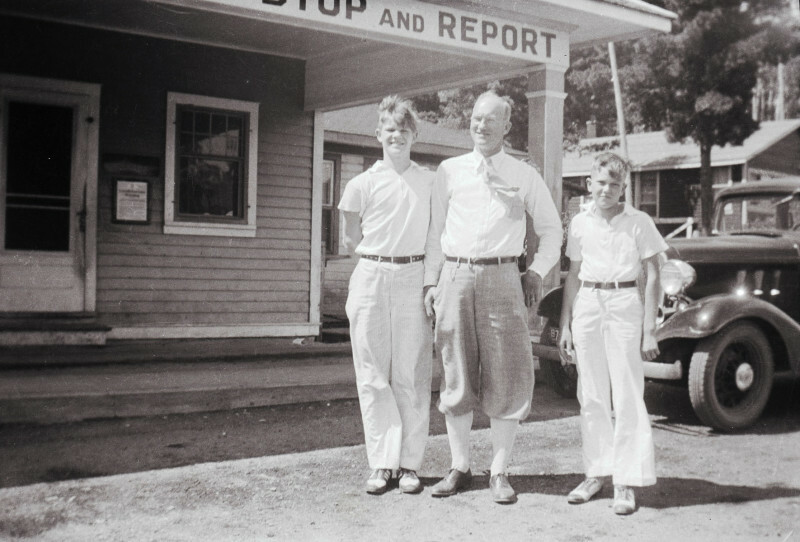 I just received two great photos from Mike Sebek of his grandfather and future uncles, the Johnsons of St Paul, on a family road trip in 1933 or 1934 at the old Pigeon River crossing between Canada and the United States on Highway 61. 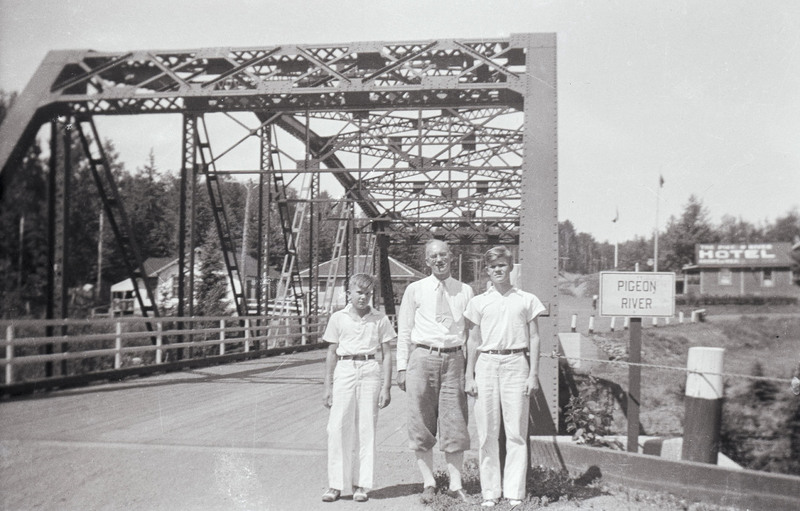 The first image shows the Johnson family posing at the steel bridge completed in 1930, looking north across the Pigeon River into Canada. From left to right: Charles I Johnson “Chuck”, Wilfred T Johnson Sr, Wilfred T Johnson Jr “Bill”. 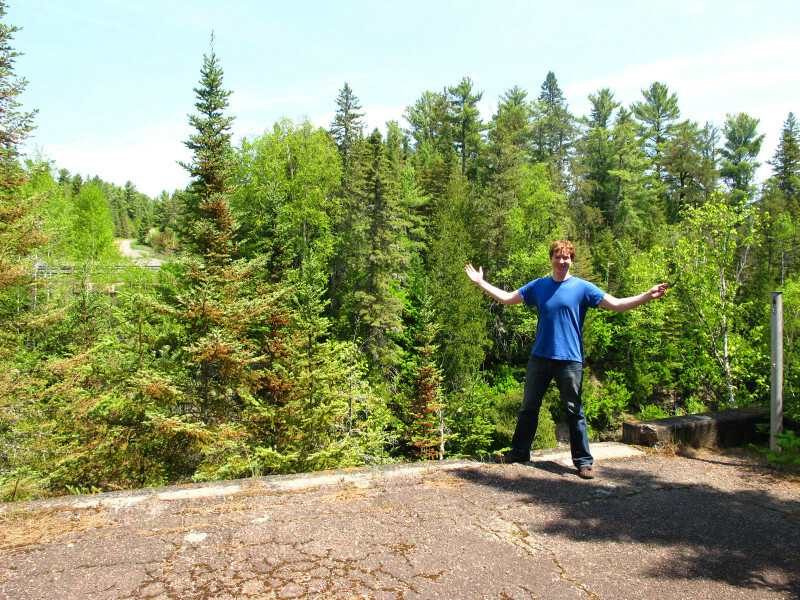 For comparison, here is me standing at nearly the same location in 2012, nearly 80 years later (the angle of the picture is to the northeast instead of to the northwest) The bridge has been removed, but the abutment remains. Many thanks to Mr. Sebek for providing the photos! Historic Minnesota Highways Interactive Map Prototype Is Up! A prototype of the map I have been working on (see previous post here) showing only data for Hennepin County is now available. 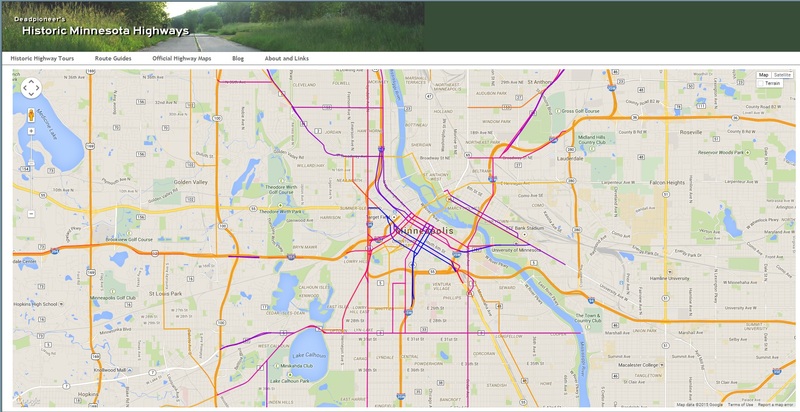 I put this together quickly, so there is no functionality other than what is already built into Google Maps. You can click any of the highway lines for information on that historic corridor. I still need to nail down the data model, the visualization, and what pops up when you click on a line. I hope to add some customization to the view of the data (limiting by year in use, route, etc). This will all take time, but at least you can do a little exploring if you’re bored at work this week. Hello fellow historic highway travelers. You may (or may not) have been asking what the heck I’ve been up to the last few weeks in terms of new content for the site. Well, I finally got my graduate degree, so that won’t be getting in the way any more…but now I guess its time to work on some projects for the site while I figure out what to do with the rest of my life. 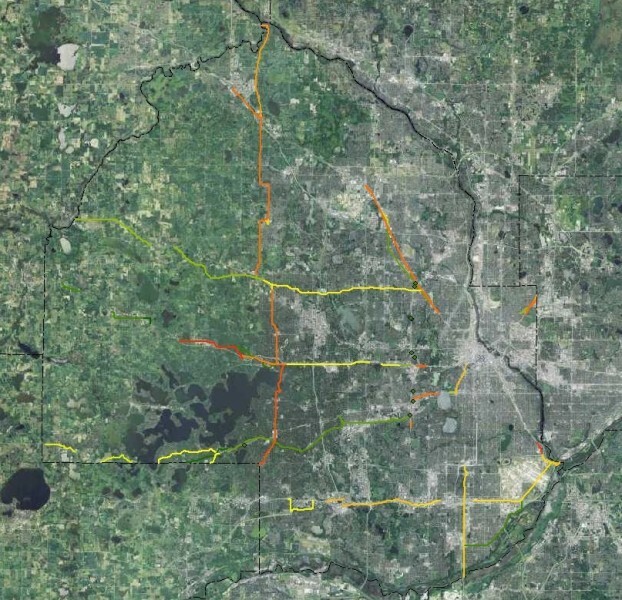 Right now I’m working on the initial data for a web map that I’m tentatively calling “Historic Trunk-Highway Corridors of Minnesota”. My plan is that it will act as a kind of big-picture map for the whole state, showing a summary of the old highway corridors state-wide. It won’t be showing every single little alignment change (the scale of that project would be too much for me alone), but instead will allow you to explore your neck of the woods (or urban jungle) and see if there is anything historic nearby for you to explore. I’m also planning for the map to have locations of historic roadsides (both surviving and lost), as well as the locations of interesting bridges of historic significance. Users will also be able to access the various photo-tours and articles from the map. In summary, the map will eventually allow you to access nearly all the information on the site. Work on this map is going to be done one county at a time. I’m starting with Hennepin County (my home county), home to nearly 22% of Minnesota’s population, and working my way out from there. I’m hoping that once I get past the dense urban counties, the work will go faster, as the areas around Minneapolis and St Paul have proven the most challenging in terms of research due to the high density of old highway corridors converging there. 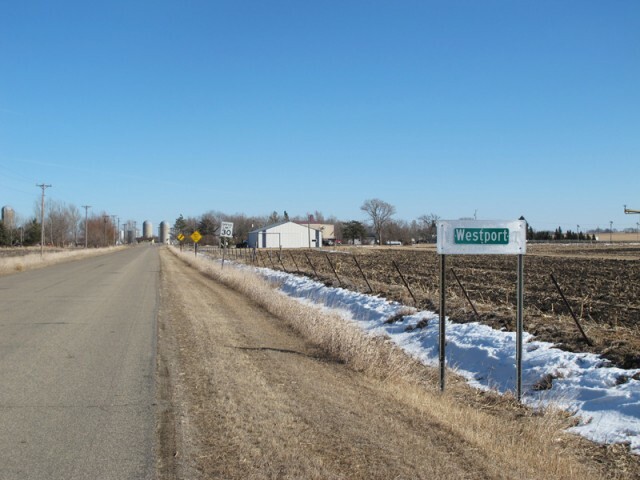 In the mean-time, I’ve got a few more features to do about Highway 100 and some of the historic road-sides, as well as some info about the construction going on in the vicinity of Highway 7. Back to work! Just a warning – the video has been severely motion-stabilized, so unless you want to have an acid flashback, don’t look too closely at the clouds. The accidentally Gary Numan-esque song is an old demo of mine that I enlisted as a soundtrack. More videos of Highway 100 to come! In the fall of 2014, MnDOT will begin reconstructing Highway 100 in St. Louis Park Park in the vicinity of Highway 7 and Minnetonka Boulevard. This will bring an end to the existence of the only portion of the original “Lilac Way” or “Beltline Highway” constructed by relief labor in the 1930’s that has managed to survive to the modern day without being fully rebuilt. The project will remove and replace four historic bridges, all of which date back to the original construction. In anticipation of this work, I headed out in early May to photograph this stretch of highway before its demise. 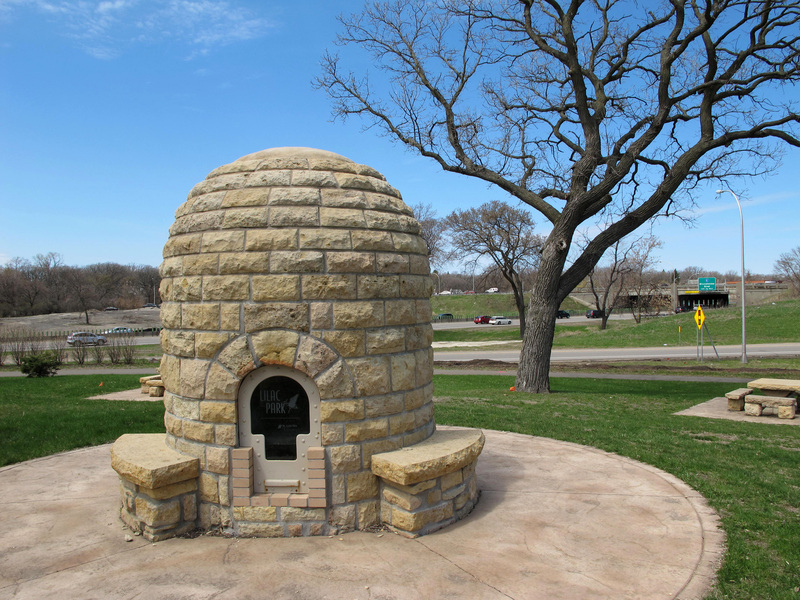 The Preservation Alliance of Minnesota recently posted about the ongoing restoration of the Burns Avenue overlook in St Paul using a photo from an article here on the site! Check out their post here. An amazing video has been digitized of the historic Spiral Bridge in Hastings, showing it in use before its demolition, and a brief shot of its demise. You can check it out here. Thanks to Cathy Wurzer for posting this on the Tales of the Road facebook page! Just added a few new photos to the “Old Highway 28” article from a visit I made in February. Sadly, the historic Westport signs on the edges of town have been stripped of their 1960 census populations, and new green name plates have been bolted on. This trail was pushed by the API (American Petroleum Institute) in the 1960’s to “package” vacations for motorists around the upper midwest to get them to…wait for it…use more oil products. The governors of Iowa, Minnesota, Wisconsin, and Illinois agreed to help promote and mark the route in their respective states. The route slowly faded into history until officially biting the dust in 2008. 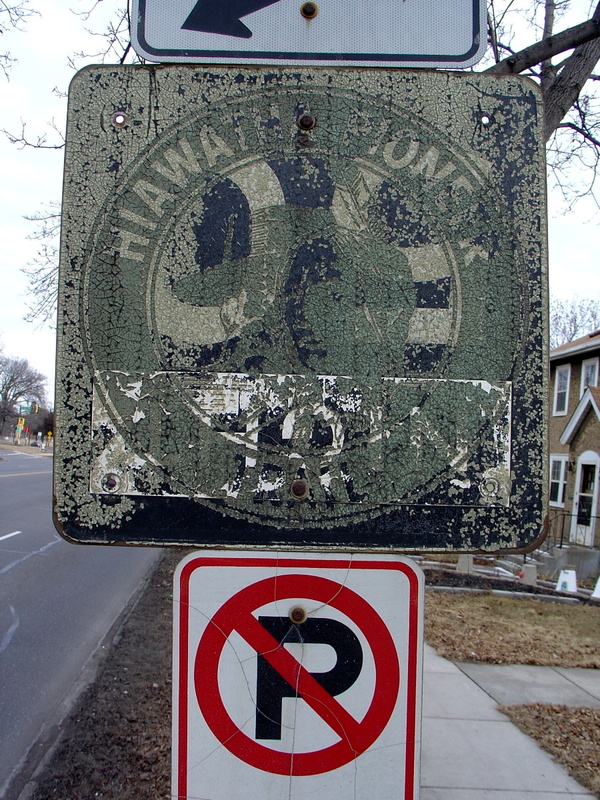 The Iowa Department of Transportation has a more detailed history here. The 1966 Minnesota official highway included a feature on the trail. You can view a scan of the map over at the Minnesota Digital Library here. 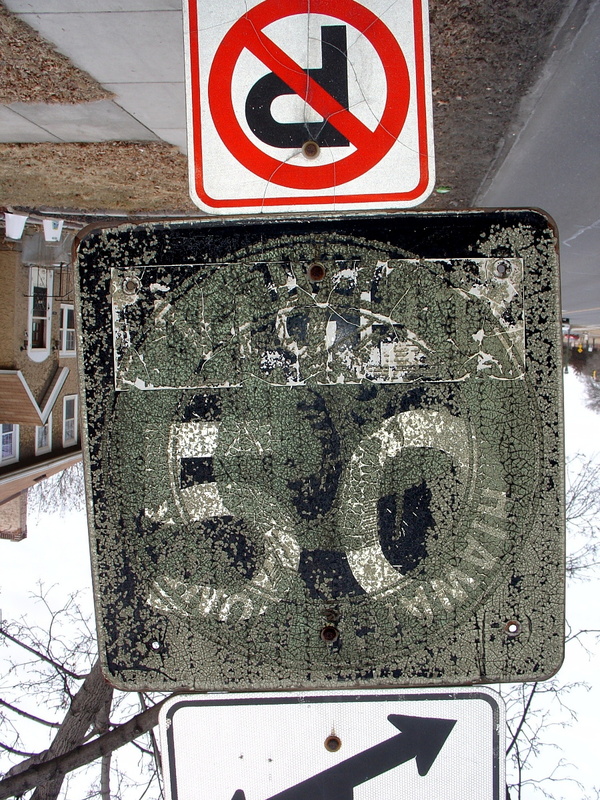 An upside-down view of the sign more clearly shows the “Night” 50 mph speed limit. Seen any more remnants of this trail? Email your pics to me at deadpioneer@yahoo.com!! 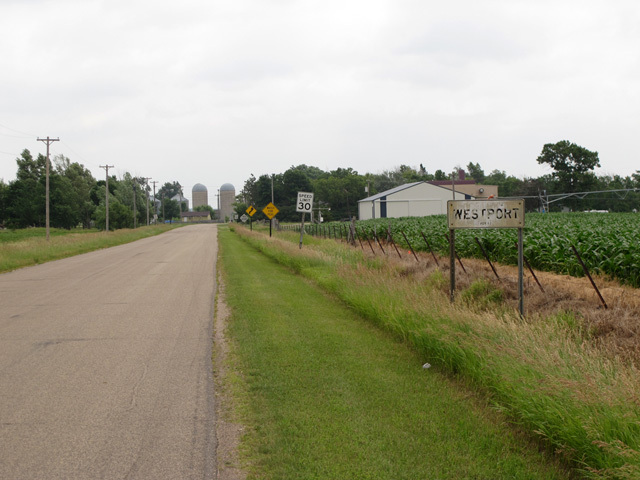 Click the image above to see the article on Highway 28’s old route through the tiny town of Westport in rural Pope County Minnesota.